Wasabi (Wasabia japonica or Eutrema japonica) or Japanese horseradish is a member of the Brassicaceae family, which includes cabbages, horseradish, mustard, broccoli, and cauliflower. The hotness is more similar to hot mustard than of the capsaicin in a chili pepper, producing vapors that stimulate the nasal passages more than the tongue. Wasabi (Wasabia japonica or Eutrema japonica) or Japanese horseradish is a member of the Brassicaceae family, which includes cabbages, horseradish, mustard, broccoli, and cauliflower. The hotness is more similar to hot mustard than of the capsaicin in a chili pepper, producing vapors that stimulate the nasal passages more than the tongue. Wasabi is usually sold either as a stem, which must be very finely grated before use or as a paste in tubes like travel toothpaste tubes. Here are 7 health benefits of wasabi. 1. Wasabi possesses anticancer properties. Wasabi contains anti-cancer nutrients called isothiocyanates that seek and eliminate free radicals within the body. Studies have suggested that 6-MITC, found in wasabi, can inhibit the expansion of leukemia and stomach cancer cells. Isothiocyanate promotes cell death within 24 hours of consumption of the root. Other studies have shown that 6-MITC is extremely efficient against breast cancer and melanoma cells. 2. Wasabi may help improve cardiovascular health. Studies have shown that wasabi can fight against high cholesterol. The isothiocyanate in wasabi has anti-platelet aggregation effects. Platelet aggregation is the clumping of blood platelets, forming a blood clot. These inhibitory effects reduce the risk of heart disease and stroke. 3. Wasabi can fight against arthritis and osteoporosis. Isothiocyanates can reduce the inflammation of joints, ligaments, and muscles. Other studies have shown that wasabi can decrease the risk of osteoporosis. 4. Wasabi can help provide a healthy digestive system. The high fiber content in wasabi helps induce regularity in bowel movements and alleviate symptoms of constipation. Wasabi is known to promote the production of bile to help protect both the liver and the gallbladder. One hundred grams hold 10 grams of dietary fiber. 5. Wasabi can help maintain appropriate blood pressure levels. Wasabi is high in potassium and low in sodium. This ratio has been positively correlated with reduced blood pressure because when it interacts with the arterial supply of vascular beds, relaxes the blood vessels, and increases blood flow. 6. Wasabi is a wonderful source of manganese. Manganese is important for many enzymes that control blood sugar, energy metabolism, and thyroid function. 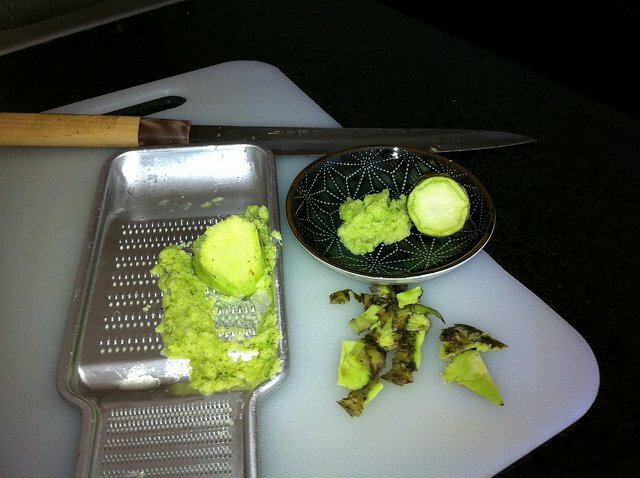 One hundred grams of wasabi accounts for 25 percent of the recommended value of manganese. Deficiencies in manganese could be associated with impaired fertility, growth retardation, birth defects, and general weakness. 7. Wasabi can help improve respiratory situations. A study from the Teikyo University Institute of Medical Mycology has suggested that wasabi provides a strong defense against some respiratory tract pathogens. Allyl isothiocyanate can aggressively inhibit the propagation of respiratory tract pathogens like those that cause influenza and pneumonia. Mohd Zakwan, N. (2011). Evaluation of bioactive component in Wasabi and other cruciferae. Ochi, H., Ramarathnam, N., Takeuchi, M., & Sugiyama, H. (1995). Antioxidative activities of wasabi (Eutrema wasabi Maxim.) leaf, stem and root extracts. Journal of Japanese Society of Nutrition and Food Science (Japan). Hou, D. X., Korenori, Y., Tanigawa, S., Yamada-Kato, T., Nagai, M., He, X., & He, J. (2011). Dynamics of Nrf2 and Keap1 in ARE-mediated NQO1 expression by wasabi 6-(methylsulfinyl) hexyl isothiocyanate. Journal of agricultural and food chemistry, 59(22), 11975-11982. Prasain, J. K., Carlson, S. H., & Wyss, J. M. (2010). Flavonoids and age-related disease: risk, benefits and critical windows. Maturitas, 66(2), 163-171. · Inouye, S., Takizawa, T., & Yamaguchi, H. (2001). Antibacterial activity of essential oils and their major constituents against respiratory tract pathogens by gaseous contact. Journal of antimicrobial chemotherapy, 47(5), 565-573.